Acting DICT Secretary Rio awarded Mr. Rajnesh Singh of Internet Society a plaque of appreciation for the organization’s role in the creation of National ICT Ecosystem Framework on 21 February 2019. 21 February 2019 — In the process of ICT policy formulation and governance, the absence of data is not the problem, but rather, the lack of a central, consolidating framework is. This would no longer be the case in the future as the Department of Information and Communications Technology (DICT), in partnership with Internet Society (ISOC), launched the National ICT Ecosystem Framework (NICTEF) on 21 February 2019. 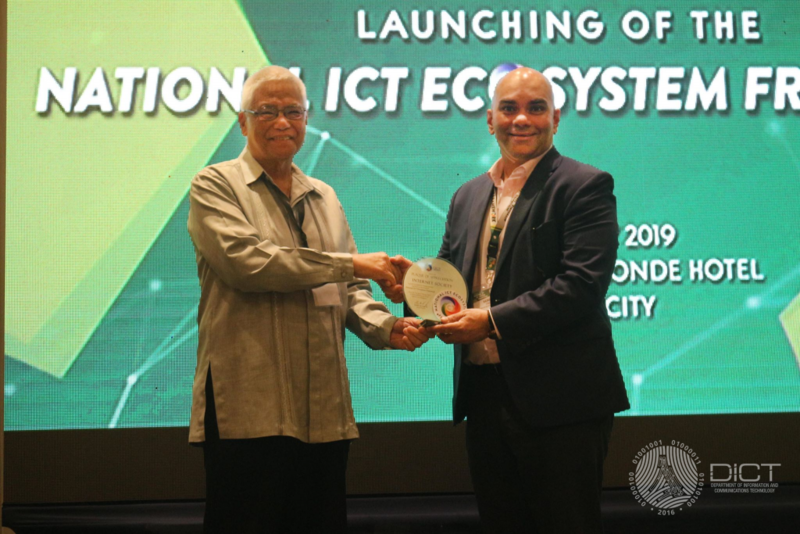 “It is now functionally necessary to address the absence of a strategic roadmap [for our ICT policy formulation],” Acting DICT Secretary Eliseo M. Rio said during his keynote speech. Acting Secretary Rio and Mr. Rajnesh Singh of ISOC led the ceremonial unveiling of the framework, which is dubbed as the government’s response to the growing need for an authoritative reference encompassing the entirety of the ICT agenda. Engr. Dominador C. Garabiles of the National ICT Planning Policy and Standards Bureau (NIPPSB) of DICT, defined the NICTEF as a comprehensive blueprint that will harmonize the country’s ICT data. The idea is to situate ICT data and its potential applications in an organized framework sensitive to a society’s dynamic nature. In brief, NICTEF will allow DICT to transform raw data to valuable information. The framework has six strategic thrusts, namely Participatory e-Governance; Industry and Countryside Development; ICT User Protection and Information Security; Improved Public Links and Connectivity; Resource Sharing and Capacity Building throughout ICT; and Enabling & Sustainable ICT Environment. “NICTEF aims to serve as a viewfinder and a strategic compass directing responses to ICT challenges,” Engr. Garabiles said. Currently, the NICTEF is still an evolving framework, with a series of regional consultations being drawn to manifest best practices and distinct policy approaches for a holistic framework development. Mr. Rajnesh Singh, in a statement of solidarity, states that the NICTEF is a tool, a “means toward a larger goal”. He concludes with a call to action to maximize the framework’s potential. For more information, you can visit http://ictecosystem.org.ph/ –a dedicated website for NICTEF set up by DICT and co-developed with ISOC.